This is very much a case of style over substance, but the atmospheric camerawork never really compensates for the subdued performances and a derivative, increasingly ridiculous plot. 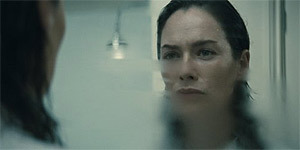 Directed by Sean Ellis (Cashback), The Broken stars Lena Headey as radiologist Gina McVey, who is involved in a horrific car crash shortly after seeing her own doppelganger. Unsurprisingly, when she wakes up in hospital, no one believes her story and, to make matters worse, she becomes convinced that her boyfriend (Melvil Poupaud) is an imposter. This being a horror film, of course, Gina's suspicions prove to be correct and it soon transpires that evil reflections are coming out of the mirrors and replacing their doubles. Can Gina warn her family and stop the invasion of the mirror people before it's too late? Unfortunately, all the film really has to offer is its atmospheric camerawork, but even Angus Hudson's crisp, stylish cinematography can't detract from the plodding pace (it's remarkably slow for an 88 minute film) and derivative plot. The main problem with The Broken is that all the good bits have been nicked from better films – there's a Psycho-style shower murder, a smattering of Polanski, a dash of Kubrick and several creepy nods to Invasion of the Body Snatchers. It also doesn't help that the film was beaten to the punch by the recent, equally stylish-but-rubbish Mirrors, at least as far as its evil mirror people premise is concerned. On top of that, the actors deliver curiously subdued performances: Headey practically sleepwalks through her part, while Richard Jenkins, in particular, is given almost nothing to do as Gina's father. The film also completely wastes Ulrich Thomsen as Gina's doctor, though you do at least learn the name for the mental disorder where you think everyone's an imposter (it's Capgras Syndrome, mental disorder fans). In short, The Broken is something of a disappointment, thanks to a dismal script, lacklustre performances and plodding direction that fails to properly exploit the film's already derivative premise.